Urban Kaarigars is a doorstep delivery service for art prints. They deliver across the country, and you can pick from myriad designs in sizes ranging from small (5.5 x 8 inches), medium (8 x 11 inches) and large (14.7 x 19.5 inches). Affordable art, decor, art prints, custom frames. The brand might have been around from 2012, but they're only really branching out now. The founder’s own tryst with interior design prior to launching this art printing and framing service means that he often knows what’ll look good on the walls. 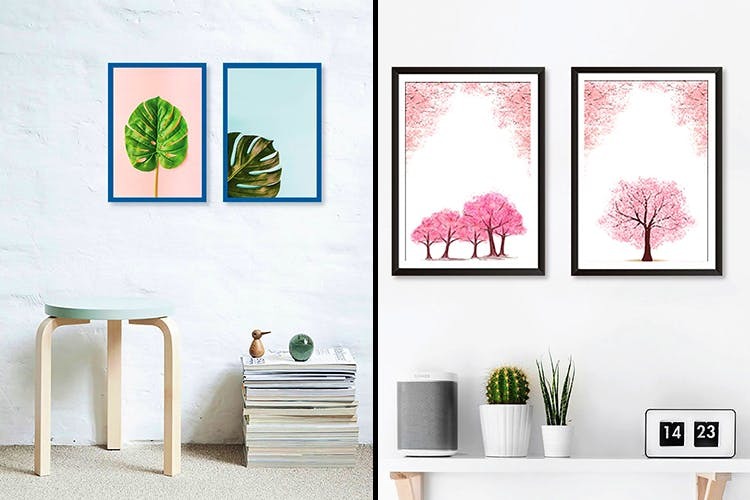 The selection of art prints ranges from cute caricatures of a Desi Hipster to a Hippy Man to nature and travel to flora and vintage, doodle-y motifs.Vikaas (the main brand man) works with his team of three where everything from art to printing and framing is neatly distributed. The prices start at INR 599 for single frames, and go up to INR 1,499 for a set of three. Oh, and did we mention that these frames are super-easy to clean and maintain and you can keep switching up artworks inside the frame? As adorable as plants and cacti will look hung in our small balcony wall, we wish they’d stock up on more themes. In fact, we'd love to see more art relating to pop culture, superheroes, feminism and literature. Keep a look out for their promotional offers and discounts on their Facebook page.By the way, they intend on adding wall lamps, table lamps, furniture and other decor items over the next few months.